Lantern's debut full-length album Below is another example of how our friends in Finland are just really, really good at this metal thing. Everywhere you look there is another Finnish band releasing an amazing album of some variety of metal. Most notable (to me) are the Finnish bands playing black metal, but Lantern prove that they can play some of the best death metal in the world as well. This is death metal just the way I like it- heavy, dark, catchy, and brooding. Lantern use memorable guitar riffs, a punishing rhythm section, and subtly dark atmosphere to create one of the best death metal albums that will come out this year. It's not as dark and brooding as Portal, for example, but very little is; also not as dark as... say, Imprecation (more on that later), but in this case it doesn't need to be, because the delicately dismal atmosphere here is married quite well with the rest of the music to deliver a coherent and potent album that doesn't rely on one element to make it's point. 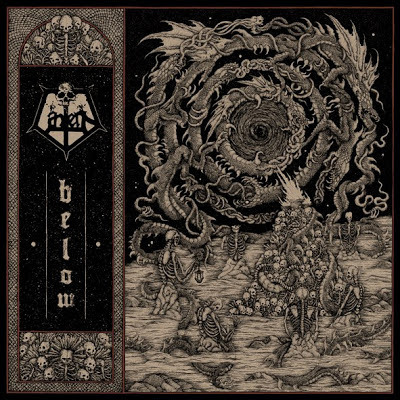 Not overly technical, Below possesses a genuine creativity that blends well with its traditional death metal vibe to really bring this album home; it's been getting a lot of spin here and will continue to. The album closer, "From the Ruins" is one of the best death metal tracks that I've ever heard, and not the only track to keep me coming back for more. People who know underground death metal have known about Texas's Imprecation for decades, and for good reason. A lot of death metal gets called "old-school" these days, but these guys actually ARE, and those of us that have been waiting for ages for them to deliver a proper full-length are highly satisfied. I have to admit that at first, I wasn't thrilled with Satanae Tenebris Infinita, but the thrill has proven to be getting to know the album. It is very dark, with a thick, surreal atmosphere, and the riffs, which are complimented nicely by some subtle and well-placed keyboards, are heavier than hell, and will punish your ears and your intellect. The more I play this album the more I love it - I wish I could tell you what my problem was when I first heard it, but it matters not - that part of me is now dead anyway. What does matter is that this is just about perfect death metal, and an album I can't recommend enough. These albums are available now from Dark Descent, which is no surprise. Matt is constantly putting out metal masterpieces, and both of these albums fall into that category. Digital versions can be downloaded from Bandcamp, here and here, but you know I recommend getting the albums on vinyl. Dark Descent always does a great job with their vinyl, so you know they are trustworthy editions. Buy the records or CDs here.